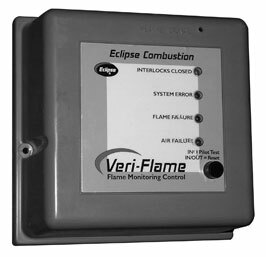 We most commonly install Eclipse Thermjet burners on furnaces. The Thermjet is an industrial burner ideally suited for glass melting furnaces for a number of reasons. Most importantly Thermjets provide a wide turndown ratio of 50/1. This means the gas/air ratio can be adjusted to stay in proper proportion from minimum to maximum output over a broad range. Proper air/gas mixture ratios are important to fuel efficiency. These burners are also designed to promote good circulation inside the furnace. They are designed to accommodate National Fire Protection Agency approved flame safety systems and are delivered with a spark plug and port for a U.V. sensor. The burner we recommend also has stainless steel internals and can be operated with preheated air. These burners require forced air provided by a combustion air blower. The industry standard for many years has been to use a fixed speed blower and control the air volume with a mechanical butterfly valve via the temperature control. In many cases this is the best option; however, for the past eight years we have been using variable speed blowers. With a variable speed blower, the speed of the blower is controlled by the temperature control. This results in a considerable savings in electric consumption. We also recommend utilizing one blower for furnaces and a separate blower for glory holes and other gas/air fired equipment. This results in further cost savings as the blower for the glory holes can be shut down during times the glory holes are not in operation. There are usually two systems that support a burner. The first is the control system. The control system can be manual but most commonly utilizes a programmable temperature control. The second system is the flame safety system that monitors the burner flame. Our most common systems are listed below with average pricing. Please call for specific applications. We will be happy to work with you and design a system to meet your needs. 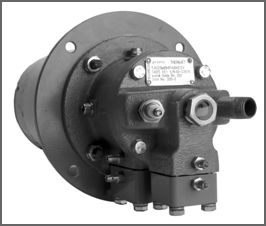 All systems provided by HUB are delivered with installation and operation instructions. We also provide training in the operation of new equipment, ongoing assistance and technical support. The Eclipse ThermJet burner uses staged air & gas mixing to provide a wide turndown range—50:1, the lowest emissions in the industry, and the highest operating velocity available. Listed are burners with stainless steel internals for 300–799° F preheated combustion air. In enclosure w/ intake filter. Various types of blowers are available. Includes all parts necessary for programmable temperature control: control, control enclosure, thermocouple, thermocouple connection wire, ratio regulator, butterfly valves, Honeywell modulating motor, metering orifice valve, and variable speed blower. Includes all parts necessary to meet National Fire Protection Agency guidelines: control panel, dual solenoid valve, hi/low gas switch, air switch, high limit temperature control, thermocouple ignition, transformer, and blower interlock. To better meet our customers’ needs, we have decided to add electric packages as an option for furnace heating. 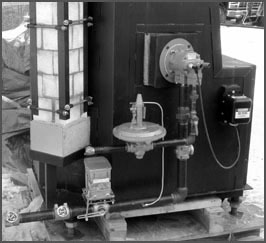 The furnace is our same tried and true free standing crucible design with moly disilicide elements instead of a burner. We have selected Duralite as a vendor for these packages. Duralite has been providing electric heating systems since 1946 and has experience in the glass melting field. They offer options that are very safe and extremely reliable. We welcome your inquiries about our electric furnaces, and we would be happy to answer any questions and provide you with a quote. No furnace system should be operated without proper training and safety precautions. We are committed to safety. Our transformer system provides galvanic isolation—there is no direct connection between the power line and the heating element. The result is a system that has no significant voltage difference versus ground. This means that you cannot be shocked. w/ Venturi, .5" needle valve, ball valve and gauge. w/ squirrel cage blower, needle valve, ball valve and gauge. for 150,000 BTU and under. Other sizes & configurations available. Recuperators use exhaust gas to preheat combustion air. They are a great solution to deal with rising energy costs and increased concern over reducing waste. We have been using a simple design since 1986, and customers who have switched from a brick flue to a recuperator claim a 30% energy savings. This is a true exhaust gas recuperator that preheats combustion air with exhaust gas only after it has left the furnace interior. The design is very simple. There are no small passages to keep clean and very little combustion air pressure drop. It actually stays cleaner than a brick flue thus reducing maintenance. We highly recommend recuperators on new furnaces and will be happy to help retrofit one to an existing application. In many parts of the country, energy companies will offer incentives for upgrades that reduce consumption.